We in Idaho hear a lot about low test scores, go-on rates that are in reverse, debates about school funding formulas, and too many students unprepared for college and career. That’s why news about academic success coming out of a rural community like Troy is exciting and worth digging into for larger lessons. The Troy School District, whose 23 teachers serve just over 250 students in one elementary school and a shared middle and high school building, has recently demonstrated impressive gains in both English Language Arts and mathematics, and the achievements offer helpful lessons for other schools and districts throughout the Gem State. Troy’s students have posted gains on Idaho’s Standard Achievement Test (ISAT), jumping 22 points in ELA to rank in the top 11 districts in the state (out of 115 districts and 49 charter schools) and more than tripling the percent of their scoring advanced on the math assessment. To learn more about how Troy’s teachers and students achieved such impressive growth, my Bluum colleagues and I recently visited with their students, teachers and district leaders. What we saw reinforced for us the importance of fostering collaboration, building strong Professional Learning Communities (PLC) to harness the collective power of teachers to benefit students, and a strong instructional framework to guide their work. During our visit, Troy’s teachers shared with us how they have approached their work together, and as we sat together, two things became evident very quickly. First, these teachers are highly knowledgeable and passionate about their work. Second, they share a common language and approach that is accessible to even their newest teachers. A novice social studies teacher spoke powerfully about how his students had struggled with unfamiliar source documents. Instead of facing this challenge alone in his classroom, as often happens, he described how the districts’ shared online instructional framework, known as Beyond Textbooks, made it easy for him to enlist help from teachers across subject and grade levels. Two other Troy teachers, from the elementary and the high school, shared how their students were similarly struggling to deconstruct unfamiliar texts in English and Language Arts. The shared instructional language from the Beyond Textbooks framework made it easy for these three teachers to work with each other across subjects to modify instruction for their own classrooms and students. This collaboration fostered a multidisciplinary approach that helped the students understand the concept of decoding texts across multiple subject areas. The effectiveness of this shared focus across content areas was documented in the results of student’s formative assessments in English class, where results jumped significantly. More importantly, the teachers shared how their students started to make connections between the subjects that they had not seen or heard in previous years, which is powerful evidence that deep learning is taking place. Listening to the conversation of the Troy education team was truly moving. It was a great example of professional collaboration that is called for in the frameworks shaping education today, from Charlotte Danielson’s Framework for Teaching (specifically, components 4d and 4e) to the National Policy Board for Educational Administration standards (which places the kind of collaborative work that Troy’s teachers are demonstrating at the core of two of their standards for the evaluation school leadership). Importantly, Troy’s example also reinforces the essential nature of high quality instructional frameworks, like Beyond Textbooks, to support this collaborative work. Beyond Textbooks is not an expensive commercial product produced by a large textbook publisher. Rather, it is an instructional framework that grew out of the work of the Vail Unified School District in Arizona. Vail is consistently one of Arizona’s highest performing districts. Its academic success came out of the dramatic cutbacks the district experienced in the economic downturn of 2008. Realizing the potential of the budget crisis to adversely impact students, Vail’s leadership team developed an online tool through which teachers could share their best lessons plans, assessments, and other tools with other educators across time and distance. All of this work is aligned to state ELA and mathematics academic standards. 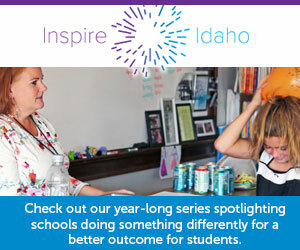 Beyond Textbooks has helped Vail lead Arizona districts in academic performance for five years. Troy in Idaho is seeing similar results. Under the leadership of Superintendent Christy Castro, Troy’s teachers have implemented the Beyond Textbooks framework to support the work of their Professional Learning Communities. And Troy’s students are benefitting. This is a story others should study. Anthony Warn is the Director of Education Development for Bluum.